Are you on the fence about enrolling your child in a camp this winter? Here are 7 amazing benefits of winter camps you’ll want to know about. Winter is upon us! Are you thinking about sending your child to winter camp? Camps provide children with a ton of different activities, experiences, and knowledge. According to many different studies and research, camp can be incredibly beneficial to children. Under a safe and supervised environment, your child will learn to define themselves as the special individuals they are. Read on to learn about 7 amazing benefits of winter camps for children. Do you have a shy child? Or maybe your child takes a while to open up to others and make new friends? Do you want to increase your child’s confidence and self-esteem? Camp enhances a child’s overall feelings of confidence. The main goal of any quality camp is to make sure that not only is your child fitting in but also that they are excelling. The first day at camp, not unlike the first day of school, can feel overwhelming. But by putting your child in a new environment, it will allow them the experience of learning to adapt. Before you know it, they will be surrounded by new friends and will be trying new things. The overall experience of adapting to a new situation and doing well brings about a higher level of confidence. High self-esteem leads to better grades, better decision making, and many other benefits. Before modern technology of tablets and phones took over, children used to spend most of their free time playing. With so many forms of digital media these days, less and less children are spending time on physical activities. A study in Canada found that only 7% of youth aged 6 to 19 got the recommended hour a day of exercise they need. There are numerous beneficial reasons for why children should be getting their hour of exercise. Camps do a great job of exposing your child to new sports and activities that they may not have tried before. These sports offer new adventures as your child gets the opportunity to explore hidden abilities that they may not have known before or build on already developed athletic skills. 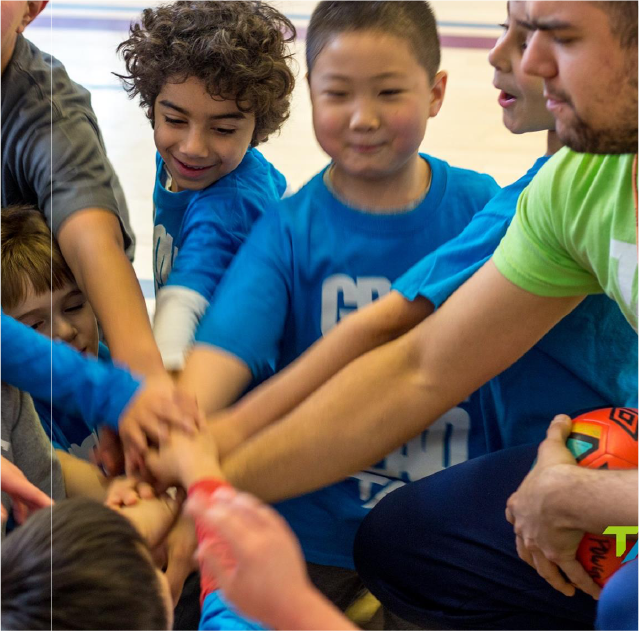 Winter camps offer great choices for children as they get to choose what sports they’re interested in. Playing increases your child’s quality of life and also gives them the opportunity to practice their social skills. Sending your child to camp ensures that they get plenty of play and social interaction time. It is an important part of child development to allow them the opportunities to learn how to make good decisions for themselves. Winter camps are the perfect environment for children to start shaping their personalities and start gaining some independence. When children get pulled out of their element and away from familiar things, surprising things can happen. Children are extremely adaptable and adjust to surroundings much better than most adults. When the safety net of parents or siblings is gone, children are giving the opportunity to take charge. Of course, there is always amply adult supervision at any quality campy, but the day to day things that mom or dad usually take care of will be completely in their own hands. This power will allow your child to learn more about themselves. Talk to any parent who has sent their child to camp, and you’re sure to hear about how they came back with new amazing changes. Winter camps are an amazing place for your child to learn how to get along with others. Talk to any child who went to camp as a child and you’ll likely hear stories of the friendships they developed during their time at camp. When children are placed in a safe environment for them to learn and develop, they adapt and grow. Learning how to play with others and learning the intricate nuances of social interaction is a great advantage of sending your child to winter camp. Your child will probably be surrounded by the same children from when they were young because most children stay in the school district as they are growing up. So while school does provide some exposure to diversity, camp invites even more diversity. Different children attend camps, sometimes even children coming from other states and countries. Research finds various advantages with children being exposed to diversity at a young age. They will get the opportunity to learn about new cultures while making new friends. Winter camps are the best place for your child to create new memories and make new friends. Because everyone shows up to camp usually not knowing anyone, children will merge and get to know children from all over. It is amazing to see children grow and expand their circles when they go to camp. Many of these children will forge new bonds that may last a lifetime. The memories that they make at camp with their new friends will undoubtedly be remembered forever. Another great thing about winter camp is that it also allows children to get to know adults who can positively influence their lives. Camp counselors are always meticulously chosen and you can rest easy knowing that your child is in good hands. When it comes to developing leadership qualities, camp is a great place to learn. Whether it’s a canoe trip, playing capture the flag, or living together, your child is learning how to be a leader. Through their everyday experiences, they are learning how to follow someone’s lead and also perhaps how to step up and be one. As children enter their teenage years, there are even more opportunities to gain leadership skills. Lots of camps offer programs that catered to young people who are looking to take the lead. These teenagers are tasked with things like planning activities and programs and caring for younger children. Learning how to take the lead teaches your child how to be a good citizen. Your child will learn how to function in a group and learn valuable lessons about right and wrong. Ready to Send Your Child to Winter Camps? As you can see, there are many advantages to sending your child to a winter camp. Your child will come back thanking you for new memories and new friends that they will cherish forever. Check us out to learn more information about winter camps!